I have a rubber plant that is about three years old. I was going to repot it, so I was looking at a web site regarding how to do this. There was a photo of a beautiful, full plant. 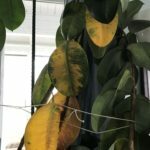 My rubber tree goes straight up - no branches at all. The plant is about a yard tall and has 19 leaves on it. Do I just want to make one cut and cut part of it off to encourage a branch to grow? You can trim the top to force it to branch. Just make sure to trim it right above a node (where the leaves grow) because this is where new branches will grow from.